As every proud home owner knows, regular curtain cleaning is essential if you wish to keep your home dust and dirt free. Whether you live in town or in a rural area, curtains get dirty – and you may not even realise. But think of it this way: it’s your curtains that shield you from the world outside; they act as a filter catching airborne pollution, dust and odours. Whatever’s in the air will, sooner or later, end up in your curtains. Perhaps it’s time to have your curtains professionally cleaned? At Apple Clean, we can do the job with the minimum of fuss and inconvenience to you. No need to take your curtains down or take them away for cleaning, then coming back to rehang them. 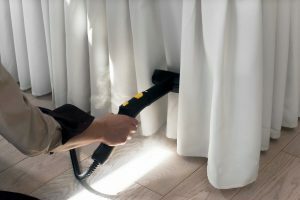 With our in-situ curtain cleaning service, we can cut to the chase. Cleaning curtains in situ means there’s no taking down or rehanging required. In-situ curtain cleaning requires no drying time. In-situ curtain cleaning will save you both time and money. Let’s face it, there’s a lot of fabric in curtains; they’re unwieldy things to handle. From standard bedroom curtains to interlined or thermally lined curtains for large Victorian bay windows, trust Apple Clean to deliver great cleaning results, all without taking down your curtains. Regardless of size, we can deal with commercial curtains in offices or hotels, and even clean oversized stage and theatre curtains in situ too. It’s the best solution all round – it’s quicker, better, cheaper; there’s not even any drying time to worry about. We pre-test your fabrics to determine the most effective cleaning products to use with your curtains. We thoroughly clean both the front of the curtains and the linings, including any pelmets, swags and tails. If desired, we can flame-proof your curtains to British standards, protecting both you and your home – because it’s better to be safe than sorry. We cover much of the south east, including Kingston and Chertsey in Surrey, Tonbridge and Sevenoaks in Kent, through to Brighton and Hove in East Sussex.